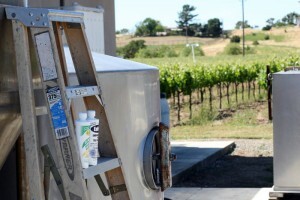 Thomas Kruse Winery uses EDFRED Shower Stall & Tile Cleaner for removing water mineral deposits (calcium and lime) from their stainless steel wine storage tanks. Tom invited us to come by and wine taste. It’s a 30 minute trip from EDFRED offices in Watsonville, California to his facility in Gilroy. 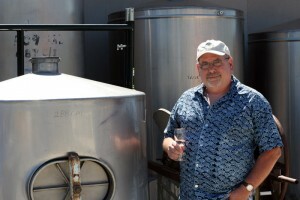 Dave in the tasting room was scheduled to host our visit. So we grabbed a camera, curious about how he was using our product for hard water stain removal. We loaded up some product for Tom and some samples for our host and off we went. As we taste, Dave takes us behind the scenes. 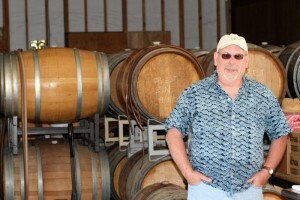 After learning the history of Thomas Kruse Winery and telling Dave the story of Ed & Fred, we headed out back to kick around and learn about operations. 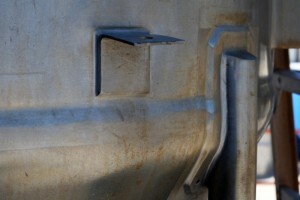 Here are some of the stainless steel wine storage tanks that they will be cleaning this summer. The tanks are misted with water to keep them cool, which creates the hard water residue buildup. These tanks are not in need of us today. We will come back this summer for some before and after photos. What is that on the ladder? Hey Dave, don’t forget the Cling N Clean Toilet Bowl Cleaner & Shower Stall & Tile Cleaner samples we brought for you! Dave treated us like family let us wander as we pleased. Let’s face it, wine is more fun than cleaners. 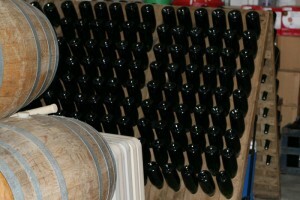 Check this out, sparkling wine in the inverted bottles, made by the labor intensive Methode Champenoise. Thanks for the tour, Dave. Get on their mailing list for notices of their activities, like bottling you own wine with them.